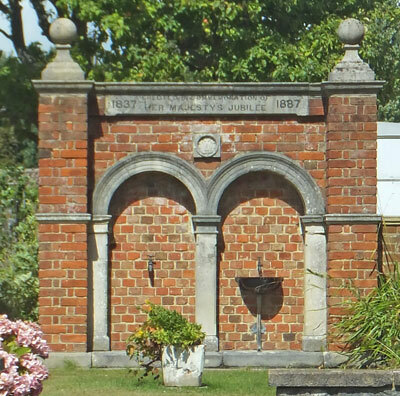 A drinking fountain was erected in Wootton High Street to the design of Thomas Chatfeild Clarke in commemoration of Queen Victoria's Golden Jubilee in 1887. Originally positioned on the lower, southern side of the high street, the complete memorial has been relocated to the garden of a house further up the hill, on the northern side. '1837 ERECTED IN COMMEMORATION OF HER MAJESTY'S JUBILEE 1887'.